Does the Deadlift Help Burn Belly Fat? Did you ever think of the deadlift to lose belly fat? Let me share a quick story with you. Six years ago I could not see my feet over my belly. I desperately needed to lose belly fat, but had no clue how. My dad bod was expanding like the universe. Like many guys, I wore my pants right under the protruding stomach. This way, I could fool myself into thinking that I really did wear a 36 inch waist pants. But, the frustrating truth was that my waist was already up to 50 inches. 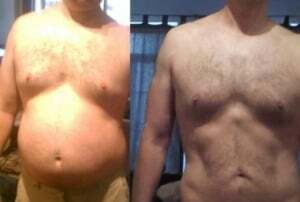 If you are the unhappy owner of a dad or grandpa bod, I can save you many years of frustration if you want to finally lean out your body. Will deadlifts shrink your stomach? I see there are opinions that deadlifts will not shrink your stomach. I disagree. The below picture is the results of strength training with the deadlift over a period of six months. I started out with a waist size of 50 inches plus at the age of 55. Six months later I was at 32 inches at age 56. But if you follow this plan to lose 20 pounds in 3 months, deadlifting will accelerate your fat loss. To the point that you will not recognize yourself six months later. And deadlifts will not just help you lose belly fat. The deadlift can change your body from a marshmallow to a much fitter version of yourself. You will lean out your body. No matter what your age. So, whoever claims that deadlifts are not effective in shrinking your stomach, I completely disagree. How to Shrink Your Stomach? Start Deadlifting! How do you burn belly fat? You need to train your body that you need muscle. If you sit around all day, will your body think that you need muscle? Your body will always take the easiest route possible to save energy. A pound of muscle costs the body between 50 and 100 calories a day to maintain. But a pound of fat only takes a calorie a day for your body to maintain. Teach your body to move. Otherwise, your body will not bother to maintain expensive muscle mass. There are 3500 calories in a pound of fat. Because one pound of weighs 454 grams, but only 87 percent is human fat tissue. 87 percent of 454 grams is approximately 395 grams of stored fats, which at 9 calories per gram equals 3,555 calories. about 13% water and 87% lipid, which means . At 9 cals per gram, that's 3555 calories per lb of fat.Muscle is about 80% water, 20% protein. So about 91g protein per lb muscle tissue. At 4 cals per gram, that's 364 calories. A pound of fat can yield 3500 calories of energy in an emergency. But a pound of muscle can only store 260 calories or so. Your body wants to protect you and have more energy available. For just 1 calorie a day, your body can store over 10x the amount of energy by holding on to fat. You have to train your body that you need muscle. And more muscle means that you create a calorie deficit even without exercise. That is where the magic begins. What Exercise Targets the Most Muscles? Which strength training exercise will force your body to build the most muscle? And what if you only have 30 minutes a day to workout? Which is better for building muscle, doing curls or deadlifting? If you could only do one exercise, which one should you choose? My vote is for the deadlift. The squat is a great overall body exercise, but is difficult to master, especially if you have knee problems. The deadlift is also a complicated lift to do it right, but can be performed by people, even in their 80s and 90s. Instead of spending 30 minutes a day doing curls, focus on the deadlift. The deadlift targets more muscles in your body than just about any other muscle building exercise. This is why the deadlift burns more calories and builds crazy muscle mass. Deadlifts work all the major muscle groups of your body – your hands for grip strength, feet and legs for power to push against the floor, ankle flexion, knee flexion, hamstrings, quadriceps, core, abs, lower back, middle back, quadriceps, gluteus, forearms, shoulders, just to name a few. When you finish a deadlift workout, you will feel the effects for hours and even days later. Forget about spot reduction, just deadlift to transform your entire body with one amazing exercise. You will achieve body transformation, not only weight loss. How Many Calories Do Deadlifts Burn in One Workout? Why Do Bodybuilders Squat and Deadlift? Who is more obsessed with losing body fat than bodybuilders? A staple exercise for bodybuilders is the deadlift. Bodybuilders know that squats and deadlifts can help burn belly fat. Because squats and deadlifts will help you build overall muscle from your head to your toes. Even if you have no interest in bodybuilding, these athletes can illuminate the path to lower your body fat. Compound exercises like the deadlift and squats are the best way to build total body muscle. And as a result, these compound exercises are a fantastic way to help you lose belly fat. Fortunately, you do not have to spend time researching the best ways to burn belly fat. Bodybuilders and other great athletes have already done so. Therefore, if you only have time for one exercise, start deadlifting. There are tons of great exercises out there. Horse riding, of course needs a horse. But for deadlifts, you do not need much space. All you need is a mat or deadlift platform, a barbell, the right shoes and bumper or iron plates. The deadlift might look simple, but it comes with more risks than taking a stroll in the park. No matter how many strolls you take, you are not going to build significant muscle. Walking is a great way to stay toned, and in shape. And yes, walking is a much safer way to lose fat. But if you want to transform your physique and build more muscle, the deadlift is the way to go. Having said that, you must learn to deadlift with proper form. If you do not deadlift with proper form, you risk hurting your shins and worse, your back. Deadlifts are one of the best training exercises on the planet. They are a powerful way to build muscle and burn fat. The deadlift is a great exercise for both lower-body strength and power development. This compound movement can assist in sporting or strength activities, as well as in activities of everyday life. If you want to get fitter and stronger, there is no better type of exercise to do than the deadlift. Start deadlifting to shrink your stomach and waist. Deadlift to build more muscle that in turn will raise your metabolism and burn fat. The answer to the question – does the deadlift help burn belly fat – is a resounding YES.